William John was born on 19th January 1859 in Kincardine, Bruce County, Ontario. He was the first of six children born to William Sutton and Sarah Keyworth. For the first eight years of his life, he lived in Kincardine with his parents and siblings. 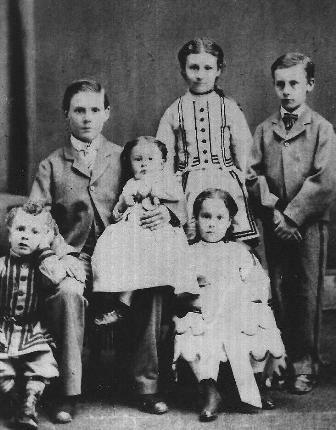 William John is on the back row seated; baby Fannie Keyworth Sutton (1870-1921) is sitting on his knee; in the front row on his left is Richard Keyworth Sutton (1868-1940) and on his right, Mary Louisa Sutton (1866-1940); behind her, Sarah Ellen Sutton (1860-1949), and far right, James Edward Sutton (1862-1935). My thanks to Keith Sutton for the photograph. William John attended public school in Walkerton before going to Trinity College School, Port Hope, Ontario, as a boarder on 12th November 1873 (when he was 14). He is there just over a year, leaving in September 1874 to attend Cornell University. Trinity College School was established in 1865 and is one of Canada's oldest and most respected educational institutions. He attended Cornell University for two years, 1874-1876, followed by a specialist course probably in assaying at the Columbia School of Mines, New York. An assayer conducts a chemical analysis of a mineral or ore sample to ascertain its content of precious metals or minerals, such as gold, copper, or uranium. "I was educated for the mining profession, but when I came out here I found very little doing. I opened an assay office on Langley Street and charged $5 an assay, but I had very few assays to make. .... I might say that in those days if you took out a piece of mineral and showed it to anyone to ask them what it was, they would look at you with a quizzical smile, as if they thought you were a little light in the upper story. That is a fact..."
William John was clearly before his time! He was forced to close down his assay office and join his father in the timber business. In 1879 William John's father obtained the first timber lease for just over 7,000 acres at Cowichan Lake and proceeded to have a sawmill erected at Snug Creek near Mahoney's Bay (now Genoa Bay). However, there had been delays in building the sawmill and his father returned to Bruce County. His father was in partnership with William Archibald Robertson who was in charge of building the sawmill. However, things did not go according to plan and the partnership broke up. It seems that overseeing the completion of the mill fell to William John who was in his late teens at the time. There are various references in the Daily Colonist to work carried out at the sawmill, for example, on 26th March 1878, "Two carpenters and a millwright will leave this week for Cowichan, to erect Sutton & Co's mill at Mahoney's Bay, Cowichan." On 24th July 1878, "Schooner Juanita, for mill supplies, arrived from Cowichan Bay yesterday. Mr Sutton came in Schooner and reports the frame of the mill buildings almost ready for raising. About 20 men are at work there." William John clearly had a lot of support from his his second cousin Alfred who becomes the foreman at the sawmill. Certainly, the 1881 census has William John living with Alfred, and his wife Margaret, in Cowichan, Vancouver Island and states William John's occupation as a saw mill owner. Alfred married Margaret in 1880, he is three years older than William John. We are told by John Saywell in Chapter Three: Pioneer logging, Kaatza-The Chronicles of Cowichan Lake, 1967, that Alfred's wife, Margaret, was the first white woman to go up Cowichan Lake. Tragically, Alfred is killed in a shooting accident in 1886, for more information see Richard Sutton (1829-1883). I discuss the Suttons' logging activities at Cowichan Bay in more depth on William John's father's page William Sutton (1828-1896). In 1889 the saw mill is sold to to Hughitt and McIntyre. William John stood in the local elections of 1887 for Cowichan district, but was unsuccessful. 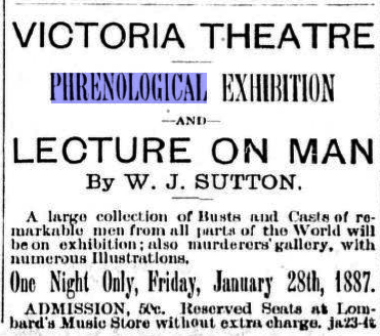 PHRENOLOGICAL EXHIBITION - The phrenology exhibition and lecture on man in the Victoria Theatre last night by W.J. Sutton, was well attended. A large collection of busts and casts of remarkable men from all parts of the world were on exhibition; also a murderers' gallery, with numerous illustrations. The lecturer discoursed most pleasantly on this popular subject and it is needless to say delighted his audience. The announcement that he would probably follow up this inexhaustible subject on a future occasion was received with marked demonstrations of applause. Mr. Sutton has evidently given much attention to the subject and is apparently familiar with all its phases. We learn, again from The Colonist that at the end of 1891 William John has presented his collection of busts and casts to the new Provincial Museum, so I am assuming he gave up his talks and involvement with the phrenology movement. William John took up the position of Government assayer in 1887 and held the post for two years. 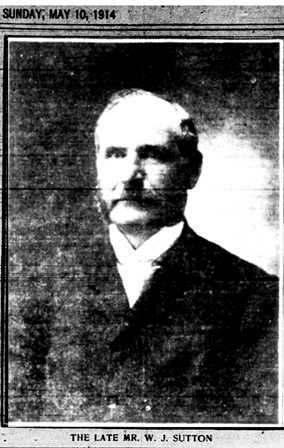 The Colonist, 1st September 1889, tells us that William had resigned his position to take charge of the Cowichan Lumber Mills adding that he had given "universal satisfaction" whilst in post. William John oversaw the selling of the mill and timberland later that year. We know from various sources, including six letters written by William John (five) and his brother James Edward (one) to Franz Boas, that they were involved in robbing the graves of First Nations people on Vancouver Island during 1888 to 1890/91. It seems initially they did this to sell the skulls to the American phrenological market but when Franz Boas heard about their collection he not only bought the lot but employed William John and James Edward to find more. I look at this in much more depth at James Edward Sutton (1862-1935). 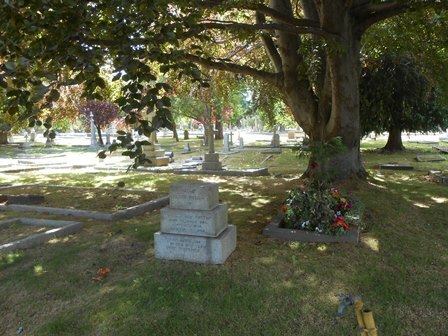 On 26th October 1892 William John marries Helen Annie Fox at St John's Church, Victoria, Vancouver Island. Helen was born in Sheffield and is the daughter of George and Margaret Fox. William John is 33 and Annie is 40. William John's profession is lumberman. They did not have any children. Along with his father, William and his brother, James Edward, William John established the Sutton Lumber & Trading Company of Ucluelet, in 1893. The Sutton Lumber & Trading Company is discussed in more depth at William Sutton (1828-1896). William John again stood for the government at the local elections for the Cowichan-Alberni district, supporting government policy of opening up roads in the district. He was not elected but it seems it was a close fight. He clearly had had enough of local politics and returned to his old favourite, geology. He completed a mining engineering degree at Michigan School of Mines and takes up the position of Assistant Professor, teaching at the School until 1899. His key subjects were Mineralogy and Geology and Petrography and Geology, although he assisted in many other subjects. 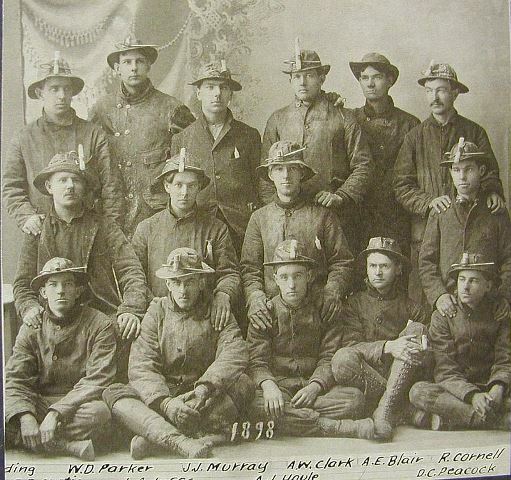 Here is a wonderful photograph of some students from the Michigan College of Mines taken in 1898. The Mining Engineering department was the first department established when the Michigan School of Mines opened in Houghton in 1885, dedicated exclusively to "mining and mining engineering." In over 110 years of its history, over 800 mining engineers have graduated. William John Sutton was teaching there at the same time the photograph was taken. On his return to British Columbia William John took up the position of geologist for the Wellington Colliery Company and remained with the Company after it had been taken over by the Canadian Collieries (Dunsmuir), Limited. Part of his job as geologist for the Dunsmuirs was surveying for coal. His knowledge about Vancouver Island and its resources was reknown and he regularly gave lectures on the subject. The lecture on "Vancouver Island and Its Resources: delivered at the City Hall yesterday evening by W J Sutton, Maine, FGS, was a treat. That was the verdict of an audience which filled every seat in the chamber, and left the building with a new comprehension of the stupendous magnitude of the grand resources of Vancouver Island. The meeting was a thoroughly enjoyable and interesting one from start to finish. Mr Sutton dwelt at length, with the skill of the trained platform speaker, on the history of the genesis of the Island; told of how it grew from the volcanic eruptions ages agone, into the splendid heritage it is today; trod with his hearers every known path in its great confines; recited the long list of splendid resources which will yet make thousands wealthy beyond the dreams of avarice, and eloquently portrayed the splendid possibilities which lie in a land so richly and grandly endowed by Nature. Dr Milne presided. In opening the meeting he explained that Mr Sutton was thoroughly competent to handle the subject he had chosen... The resources of Vancouver Island were many - coal, gold, copper, timber, fisheries and agriculture - all in their infancy of development. The various resources were immense, and the future promised much. He enumerated the extent to which the various industries on the Island had been developed. The opening up of the Island by means of a railway would mean a large increase in population. The country could only be opened up by a direct line of railway to the North end of the Island. In an Imperial sense, the line would possess great strategic value. No one could say when just such a line might be required for Imperial purposes... Mr Sutton, on rising to speak, was warmly applauded. He had, he said, been studying Vancouver Island for many years in a professional way, and he had roamed over its hills perhaps more than any other man living. He felt it his duty to disclose some of the information he had gained, because this was a popular movement for Island development. He then dwelt very entertainingly on the geological character of the Island, explaining by means of a chart the growth of Vancouver Island as a mineral producing country from the early ages. His conclusion from a close study of the geological formations were to the effect that great volcanic eruptions had taken place in bygone aeons, perhaps the greatest that the earth had ever experienced as the disturbances shook the country from the Queen Charlotte I to the Straits of Fuca. Eruptive activity must have continued for a great period of time, then as a result of this enormous disturbance there were smaller agitations in the earth's crust in this neighbourhood. All through the Island were to be found granite formations. Ore bodies were to be found between the granite and the limestone. Iron ore in large quantity was to be found in the neighbourhood of Quinlam Lake. Volcanoes could be regarded as "natures boiling pot." It had been said that Vancouver Island was too broken up to be a great mineral producing country. That was all rot. They could not expect great mineral bodies unless there was great volcanic activity at a previous period. He then took up the mineral deposits of the Island as they at present were in evidence. Galena had been found on the Island in the neighbourhood of Koksilah River by himself and Mr W A Robertson, their experiences on this occasion being somewhat amusing. They brought a large piece and had it assayed, and afterwards the location was called the Sterling mine. He illustrated the difficulties which pioneers had a number of years ago, he and Mr Robertson having had a very trying series of experiences on the West Coast. They were out 2 weeks, and had only one dry day. But they succeeded in crossing the Island from West to East, from Barkley Sound to the Qualicum River. No one but a man of tremendous determination could master the difficulties met with in exploring the rugged Vancouver Island. On the West Coast there were important deposits of copper and iron. Cinnabar was also found on the West Coast. Around Kennedy Lake and up Elk River extensive deposits of gold-bearing rock had been located. All along the areas of the West Coast were to be found big deposits of copper and iron... He then turned his attention to a description of the great timber resources of the Island. ....I might state another experience I had on the WC in the neighbourhood of Wreck Bay, where black sand containing gold occurs. My brother has been interested down there, and they have taken out in the neighbourhood of $20,000 in gold. I named it Lost Shoe Ck, because I lost my shoe there. The salal was so thick that I had to roll over it, instead of forcing through it. That is the only way I could get through the thicket, so I rolled down to Wreck Bay, and when I reached Lost Shoe Ck I had to ford it. In crossing I lost one of my shoes, which was carried away by the current. They say necessity is the mother of invention, and so I made a pair of moccasins by tearing off a piece of my trousers, and I started down Wreck Bay as far as Ucluelet. I had to cross over this, and, as usual, the tide was in. 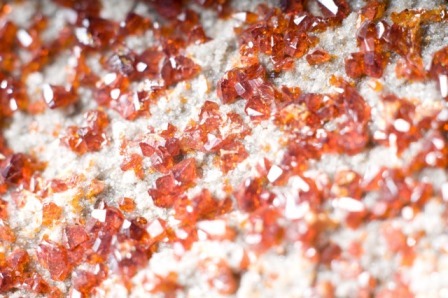 ...and close to Sechart we have found cinnabar, an ore of mercury. ...In that connection I might refer to another trip that I made with Mr [W A] Robertson, just to illustrate the difficulties pioneers had at that time. We wanted to go up to Alberni and examine Barclay Sound and Alberni Canal. The old stmr Maude used to make bi-monthly trips to Comox, and we went up on her, intending to land at the mouth of the Qualicum, but it was as rough in the Gulf of Georgia they landed us at Deep Bay, and we had to tramp along the shore, covered with boulders, and it was worse than a treadmill. Anyway, we reached Qualicum, and went over the trail and examined the country bordering Barclay Sound, and went down to Bamfield Ck, where the Pacific cable has now its terminal. We intended to go up to Central Lk and cover that country, but it rained incessantly. We only had one fine day, and I believe that was Sun, during all the time we were there, so we made up our minds to start back. We started out with the intention of reaching the Qualicum and catching Maude on her down trip. We had to start at 5am. We passed by the Alberni townsite. At that time there were only 3 settlers there - old Mr Clark, Mr Taylor and Mr Merriman. We stopped at Mr Clark's house and had some pea soup, and I have never forgotten that pea soup. It certainly stuck to my ribs that day. Accompanied by his wife, and sister Fannie, William John went on an extensive European tour in 1903-04. They visited France, Italy, Egypt, Austria, Germany, Belgium and England. Whilst in England they went to Sheffield, where William John's wife was born and it seems highly likely that as they visited Cumberland they would have visited Dent where William John's father was born and, of course, the birthplace of the famous British geologist, Adam Sedgewick who knew William John's grandfather as he was the executor of Ann Sill's will under which Richard Sutton inherited a significant amount of money and property. I include extracts of the visit to Manchester and Sheffield from Helen Annie's diaries at Helen Annie Fox. 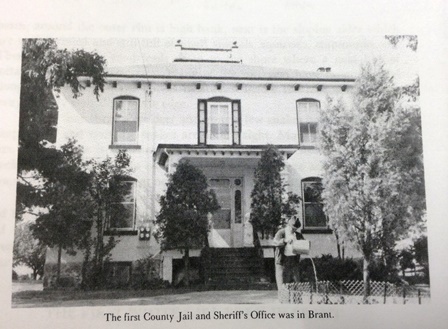 In 1911 William John and Helen Annie lived at 749 Discovery. As well as being a very important geologist, William John also played an important role in the infrastructure of Vancouver Island. He took a prominent role with the Board of Trade and the Vancouver Island Development League. He was chairman of the Western Branch of the Canadian Mining Institute, as well as belonging to the Astronomical Society and the Natural History Society for which he was president (1912-1913). Given the above it would hardly be surprising that a local Pass was named after William John Sutton. Local historian, Ken Gibson, told me about Sutton Pass. Here is another video of Sutton Pass in March. And here another video Highway 4 (Sutton Pass and Kennedy Lake) Ucluelet by Tofino. Other places named after him include Sutton Peak, Sutton Creek and the Sutton Limestones. SUDDEN DEATH OF VALUED CITIZEN. 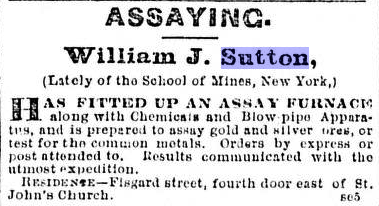 Mr W.J.Sutton, an Esteemed Victorian, Died at Ucluelet Yesterday Morning - Distinguished Mineralogist. Vancouver Island has suffered an irreparable loss and Victoria is deprived of one of its foremost pioneer citizens by the death yesterday morning at Ucluelet, on the West Coast of Vancouver Island, of Mr. W. J. Sutton, who succumbed without prematory warning to a stroke of apoplexy. A pioneer in Island development, admittedly the greatest authority respecting the resources of this section of the Province, a mineralogist of large practical experience, and one of the most energetic workers for all that had to do with the advancement of Victoria and the Island, the news of his untimely demise came as a shock to the whole community. A Colonist correspondent yesterday afternoon wired from Ucluelet the following dispatch, containing brief particulars of the sad event: "W.J. Sutton dropped dead at 9 o'clock this morning while running a survey line for a road in process of construction. He and his party were at work at a point a mile and a half back in the bush. On news reaching here a party, consisting of sixteen men, including the life-saving crew, hurried to the scene, and the body was later conveyed here. An inquest was held at noon, and a verdict of death from apoplexy returned. The body will be conveyed to Victoria tomorrow morning by special boat. Mr. Sutton had extensive holdings in this district and was universally esteemed." Mr. Sutton left for the West Coast on Thursday, apparently in the best of health. A native of Bruce County Ont., where he was born at the town of Kincardine, on January 19, 1859. Mr. Sutton, after being educated in the public schools, took courses in mining and geology in Trinity College, Cornell; Columbia School of Mines, New York, and the Michigan School of Mines. Coming to Victoria in 1877, he was for several years assayer in the Provincial Department of Mines, and held other posts in the service of the Government. On leaving the public service, Mr. Sutton joined the staff of the Dunsmuirs, who, besides owning great coal mining interests on Vancouver Island, had large possessions of land in the belt granted them at the time of the construction of the Esquimalt & Nanaimo Railway. It was while at this task that Mr. Sutton developed an interest in the resources of Vancouver Island which remained with him up to his death. It is but the bare truth to say that this personal knowledge of the Island was greater than that of any other man. He had visited practically every section of it from Cape Scott to Victoria. His services were always at the disposal of those advancing plans for the further development of the Island by railways or otherwise, and on innumerable occasions he delivered lectures illustrated by specially drawn maps and lantern slides on the topographical features of the country and its mineral resources. He was ever extremely optimistic about the future of the Island, and especially was he firm in the belief that there would be great development on the West Coast. He possessed one of the finest and most comprehensive private mineral collections in the West. On the coal mining interests of the Dunsmuir passing to the Canadian Collieries, Limited, Mr. Sutton was induced to retain his position and this he held at the time of his death. 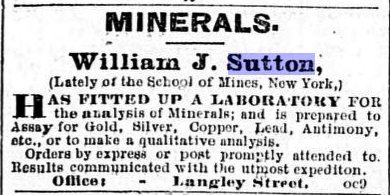 Mr. Sutton's reputation as a mineralogist was by no means local. He was known all over the continent and in Europe as an authority of Western Canada. He was a member of the American Institute of Mining Engineers, vice-president of the Canadian Mining Institute and chairman of the Western branch, a Fellow of the Royal Geographical Society. While never seeking anything in the nature of public honors, Mr. Sutton's strenuous duties in the field permitted him to give time to congenial tasks in the interests of the country. Thus he was a very active member of the Board of Trade and the Vancouver Island Development League; and it was only a few weeks ago that he spent much time in assisting in the work of re-organising the latter body. He was one of the foremost members also of the Natural History Society, of which he for some time held the office of president. Some eight years ago Mr. Sutton made an extensive tour of the world, keeping away from the beaten track and visiting such points as the interior of China and India, and Egypt. He was constantly seeking to enrich his store of knowledge, and being of a very observant turn of mind, his experiences proved very profitable. Of a most attractive and winning personality, he was a delightful raconteur, and he will be greatly missed by a circle of close friends who spent many happy hours in his company. For a number of years Mr. Sutton's residence has been on Discovery Street. In 1902 he married Miss Helen A. Fox, eldest daughter of the late George Fox, one of the earliest business men of the city, and the sister of Mr. George T. Fox, the well-known cutlery dealer, of Broad Street. In addition to his widow he is survived by three sisters, residing here, Miss Sutton, Mrs. F.H. Fatt and Mrs. Gray; two brothers, Mr. J.E. Sutton, in California, and Mr. R. Sutton, Walkerton, Ont. Although generally acknowledged by mineralogists and geologists to be one of the most perfect collections in existence, there are only a few other people aware that a quaint old family residence on Discovery Street, Victoria, contained such a priceless display of crystals, minerals, earths and precious stones, as that so carefully collected from all quarters of the globe by the late W.J. Sutton, a gentleman of vast experience in this particular branch of scientific research. Unfortunately for the complete consummation of Mr. Sutton's life work, and his earnest desire to see his efforts preserved for all time in the University of British Columbia - where, as he hoped, that institution would become an accomplished fact. The great mineralogist passed away in the year of 1914, and it was left to his devoted widow and her sister, Miss Fox, in conjunction with the learned Faculty of the University, including Professor S.J. Schofield, Dr. McKechnie, Professor T.C. Phemister, the latter a clever young scientist and mineral expert from Glasgow and Cambridge Universities, to bring about the successful transfer from this city to the new university building in Vancouver, B.C. In addition to these gentlemen, and acting in an advisory capacity, during which period he gave much time and interest in order to complete negotiations, William Fleet Robertson, of Rockland Avenue, is to be heartily congratulated, for there was for several years a possibility that this wonderful collection might have passed out of the country, and this would indeed have been a lamentable event. As may be inferred from the above remarks, the late Mr. Sutton was a great traveller and it may be remembered acted as geologist for the Dunsmuir interests. In this capacity he visited practically every corner of the world. Many of his much-prized specimens were gathered in Egypt, while others were selected from Mexico, from the farthest points on this continent, from north and south mining districts of Europe, while his collection from various parts of British Columbia will for all time be of the greatest assistance to youthful geologists and scientists of the university whose desire it is to delve further into the bowels of this old earth of ours. Even to attempt giving an idea of this splendid collection would require a volume, but it may be casually noted that many of his crystals are unique, and it is highly probably that their equal could hardly be found in the museums of the country. While the much-sought precious yellow metal is seen in abundance, the various colorings are particularly pleasing to the eye. Quite a number of golden nuggets, and indeed in all forms, would suggest to the present day prospector a great longing to meet such lucky 'finds,' while the collection of baser metals gives assays almost too good to dream about. In addition to every known metal, the collection has a series of wonderful polished marbles and choice rocks, while several of the scientific instruments used during Mr. Sutton's exhaustive efforts are the finest that have ever been produced. Some idea of the extent of this splendid array may be gathered from the fact that in addition to sixteen large cases of small minerals each averaging 600 pounds, and close on a dozen cases of books of rare value from a mineralogist's point of view, there were a number of cases of coarse specimens of the heavier metals, the whole weighing a matter of twelve tons. In order to prevent any possibility of damage, every specimen was carefully wrapped in wool and excelsior, and each case heavily crated, the whole being packed and shipped over the C.P.R. service by William Hurd and an experienced staff of Victoria . . . under the personal supervision of Professor T.C. Phemister of the University and William Fleet. I would like to thank Pete Nestoruk, Victoria Central Library, British Columbia, for sending me newspaper clippings. I would also like to thank local historians Ken Gibson and and in particular Leona Taylor who has helped tremendously. William John Sutton's influence on the development of Vancouver Island is summed up by the words of local historian, Ken Gibson: "The 'story' of his 'impact' would fill a 'book'." Now that is an interesting proposition...I have begun writing his biography and am amassing lots of information, both primary and secondary. Here is William John and his wife Helen's grave; the cross is missing. Appropriately, it lies underneath a huge copper beech, my thanks to Leona Taylor for photograph. I love what I call 'sliding doors' experiences with regard to family history; in other words, coincidences. Despite not being a direct descendant of William John, but from the same grandfather, I feel a strong connection with him. It is interesting that my brother named the house he built Copper Beech and had a copper beech tree planted outside.